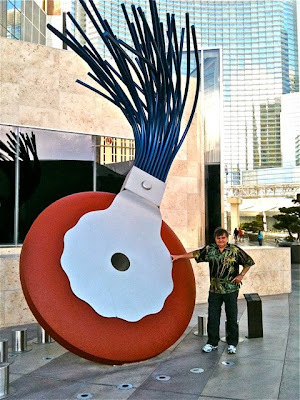 George Rodrigue and I spent the past few days in Las Vegas, Nevada. We trekked to and through the City Center, wanting to see the much-touted series of structures firsthand. Although the architecture is over the top and the occasional art piece of interest, ironically it was a bookstore that occupied our afternoon. We talk about bookstores probably more often than most. 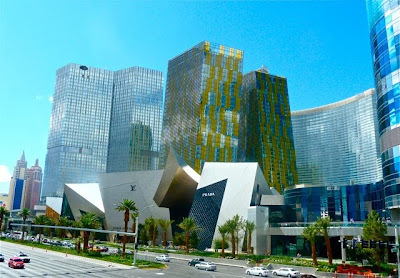 Usually our discussion involves book tour nostalgia, as well as a growing personal connection to certain stores and their staffs. 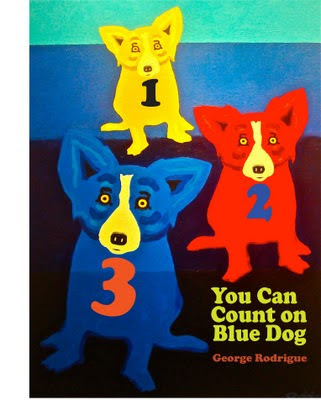 Over the years a variety of publishers produced more than a dozen books on the art of George Rodrigue. The categories vary and include fine art books of his Cajun and Blue Dog paintings, children’s books, holiday-themed gift books, and even cookbooks. 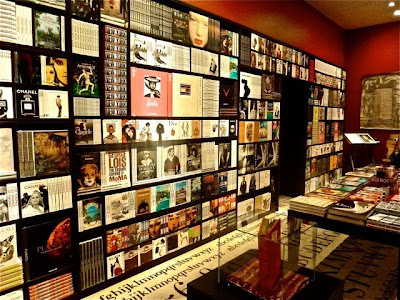 Shocked to find a new bookstore, the likes of which we’d never seen, we stumbled open-mouthed into Assouline, a New York City publisher of gift and fine art books. If not the store, George and I both are familiar with the product. Their publications include boxed sets spotlighting fashion and other lofty interests, offered for a serious price through the catalogues of high-end department stores. 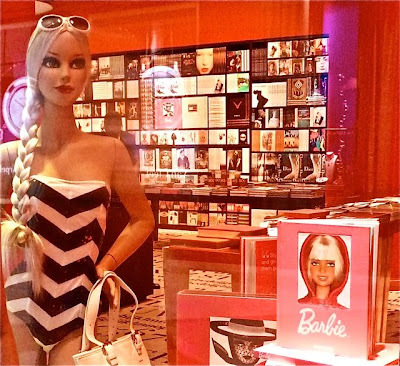 In addition to these collections, they specialize in large-scale tomes featuring artists such as Magritte or the history of Penthouse Magazine or their latest project, a tribute to Barbie. These heavy, beautiful paper objects run anywhere from $300 to $1500. They are limited in number and, when possible, include the appropriate signatures. The store, its presentation, and its titles are stunning and, for now anyway, impossible to reproduce on a laptop. Driving home the point, 16th century large-scale original paintings (portraits of royalty and nobility) take up any space not devoted to books, so that the bookstore ends up a cross between the slick of the contemporary and the idolized of the old world. We couldn’t help but relate our bookstore adventure to George's gallery and art books. In George’s galleries we avoid selling books, preferring to focus on the paintings and silkscreens. However, it seems obvious that books aren’t just books anymore. Perhaps it’s time we take a second look at these titles, books that in most cases took years to produce and include beautiful reproductions of George’s paintings, many of which are unavailable in print form. This holiday season we will issue, for the first time, several boxed collections of signed, out-of-print first editions. * ‘The Art of the Art Book,’ I guess one could say. Unlike the constant publishing projects of the old days, today we tiptoe when it comes to new books. We still meet with publishers and toss around ideas, as though nothing has changed. However, we all see the Kindles throughout the airport. Even George couldn’t resist the i-Pad and wrote a children’s book application using his paintings (due out next spring). 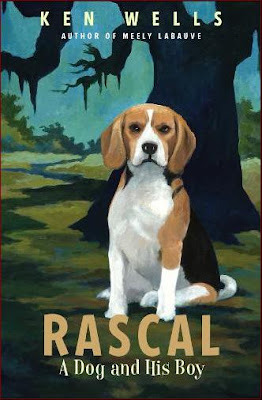 These days he's more likely to contribute to outside projects, such as his recent cover art for Ken Wells’ story for young adults, Rascal, and his painting and text contributions for Debra Shriver’s tribute to New Orleans, Stealing Magnolias (both of which I’ll cover in future posts). In New Orleans, my office is a jewel box of special books. They include gifts from authors and friends, first editions of my favorite reads, especially books rooted in Louisiana, as well as assorted National Book Award, Booker, and Pulitzer titles. These blend with hundreds of art books, some from my mom, some from George’s art school years, and most purchased on our travels, as memories of museum exhibitions or personal debates. I wrap each title in plastic and periodically turn out the special covers, Steamboat Gothic, The Collectors, Peace Like a River, so that the bookshelves become a changing work of art. Our afternoon in Assouline (pictured above) was no different. Although tempted by Barbie, I spent a chunk of George’s slot machine winnings on a reproduction of a 1902 book of French text and paintings illustrating the life of Louis XIV (and no, I don’t read French). And George? He spent the remainder of his winnings on The History of Penthouse Magazine. *although we haven’t worked out all of the details yet, I’m fairly sure that together the two sets will include The Cajuns of George Rodrigue (Oxmoor House, 1976), Blue Dog (Viking Penguin, 1994), George Rodrigue: A Cajun Artist (Viking Penguin, 1996), Blue Dog Man (Stewart, Tabori & Chang, 1999), Blue Dog Love (Stewart, Tabori & Chang, 2001), The Art of George Rodrigue (Harry N. Abrams, 2003) and George Rodrigue Prints: A Catalogue Raisonne (Harry N. Abrams, 2008). I would've passed on the Barbie book too. After recently acquiring a Kindle, I'm now less fearful of the disappearance of books. Although I'm enjoying the convenience of a Kindle, I absolutely despise not being able to share my reads. I'll actually plug an amazing book I'm reading on my Kindle now-- Cutting for Stone by Abraham Verghese. I would bring you the hard copy if I had it! I don't think anything can replace the look, feel and smell of a real book! I went to "The Authors and Ideas Festival" last week-end, where we shared our favorite books and Cutting for stone was mentioned more than once. I still don't have it but now I will. Thanks for the post about books. I think you know from my blog that I am a book lover. I hate to see bookstores disappearing but I think it's the monster book chains that contributed to the death of bookstores as well as Kindles, computers, iPads, etc. Although fewer people read books, those that do read more and buy more books. I confess to buying my books on Amazon for convenience's sake, but I do buy (too) many so perhaps that helps publishing in the end. Art books especially will never make it on Kindle or iPad. You need the depth that printing gives for even the poor approximation of the real thing, and art books deserve to be revisited and collected in the flesh. Your office sounds great. I love looking at all the titles and covers of my collection. I love that painting Georgd did for the cover of "Rascal." The expression on Rascal's face is such a serious dog face. Very true to life but a genuine Rodrigue. It couldn't be a cover by any other painter. The color and composition really pop. Hi Nancy, Thank you for your insightful comments. I so hope you're right about art books (and I have a lot of friends in publishing that also hope you're right). Art books have always been a rather small number when it comes to printing, so perhaps that will help. Unfortunately that fact (along with the expense of making them) means that no one makes much money. The publishers need the other books, the mass market books, for their bread and butter. And yet Assouline was encouraging! A brand new bookstore devoted to (mostly) art books!